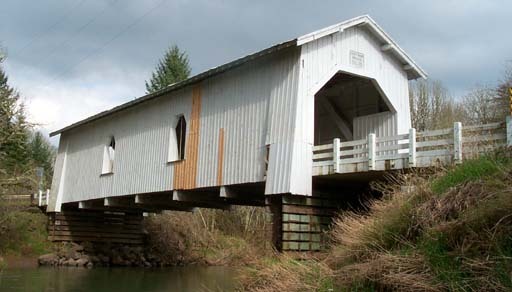 The Gilkey Covered Bridge crosses Thomas Creek. It was built in 1928. 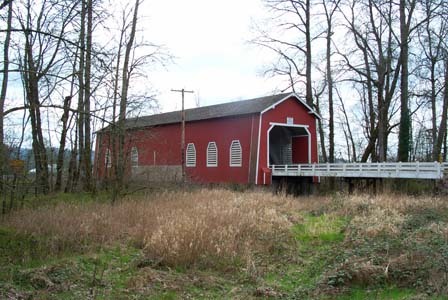 The Gilkey Covered Bridge is one of the best kept bridges you will visit on the Scio Covered Bridges Tour. 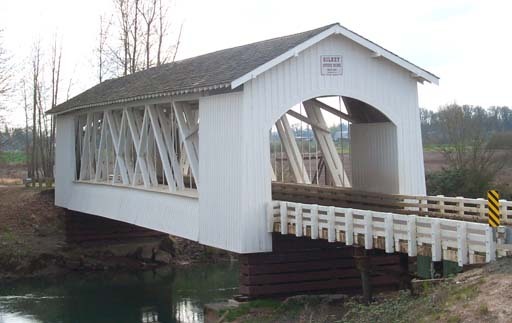 It’s clean white paint is a common characteristic of many of Oregon’s Covered Bridges. You can pull off the road near a railroad trestle that also bridges Thomas Creek. Take Robinson Drive west of Scio, OR., about 3 miles. Turn Left (south) onto Hungry Hill Road. Travel about 1 mile to Gilkey Covered Bridge. Huffman Covered Bridge crosses Crabtree Creek. It was built in 1936. Take HWY 226 west (south) of Scio, OR., about 3 miles. Turn Right (west) onto Hungry Hill Road. Travel about 2.5 miles to Huffman Covered Bridge. Larwood Covered Bridge spans Crabtree Creek. It was built in 1939. The Larwood Wayside was developed beside the bridge and is a great place for a picnic. Picnic tables and a bathroom are easily accessible. You will be treated with views of both the Larwood Covered Bridge and an abandon waterwheel on the south side of Crabtree Creek. Here you will see Roaring River and Crabtree Creek merge. This is an unusual event because part of Crabtree Creek flows into Roaring River before Roaring River merges into Crabtree Creek. This occurrence creates very interesting currents and is worth taking the time to enjoy. Take HWY 226 east of Scio, OR., just over 2 miles. Travel southeast for about 5 miles along Larwood Drive until you find the Larwood Wayside park and the covered bridge. 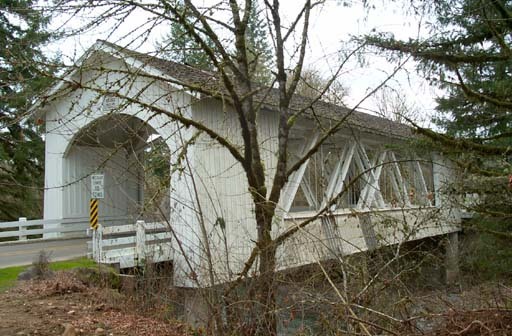 Next stop on the Scio Covered Bridge Tour: Huffman Bridge, Scio, OR.